Yeah, I know. Uncle Rod was supposed to have been off on yet another Chiefland Astronomy Village deep sky tear this week with the new CGEM and the carbon fiber C11, Big Bertha. The weatherman had other ideas. The closer I got to my Thursday morning departure, the worse the forecasts became. If there is a dog’s chance in heck of getting anything, I am not reluctant to make the six hour drive down, but when it's clear all I'll see is the inside of the Chiefland, Florida Quality Inn? That is another matter. Sunday, weather forecasts for the CAV were looking poor. Not dire, but the handwriting on the wall began to be visible. On Wednesday morning, the outlook had not gotten better; if anything it was worse. Reluctantly, I cancelled my motel reservations. I was sorry to do that, but the bitter memory of my most misbegotten CAV trip ever in January of 2014 lingers in Unk’s mind. Well, if I couldn’t observe at the Chiefland Astronomy Village, maybe I could play with one of my refractors in the good old backyard. 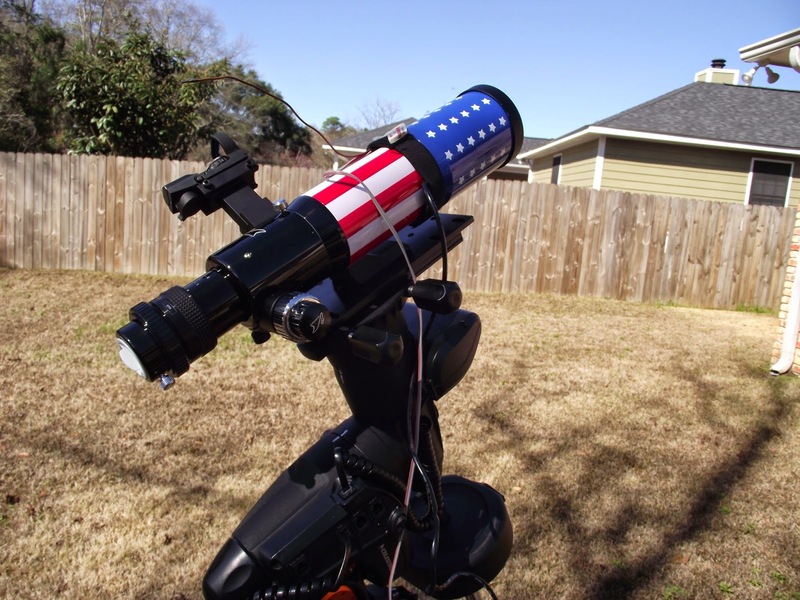 It’s been quite a while since I reported on my 66mm William Optics Patriot SD refractor. Six freaking years as a matter of fact, and even then the little thing didn't have a starring role, being overshadowed by my paean to my good, old C8, Celeste. I did praise the Patriot for her wide-field views of the Herschel 400's larger open clusters under the dark skies of CAV, but after that trip I put her back in her case and left her there. For a long, long time. The Patriot had done well on the star clusters of the Herschel 400, but as I finished up the rest of the list, began the Herschel II, and then the Herschel Project, my quest to view/image all 2500 aitches, there wasn’t much left for a little telescope to do. There’s a limit to what you can do with a 66mm refractor, after all; even in the grab and go role it is nudged out by my 80mm lens-scope, which can show more and isn't much harder to, well, grab and go with. But, nevertheless, the 66 is a cool looking little thing, and she takes good pictures. Really, the only sad thing about this 66mm refractor is that she is a dodo. Sort of. She ain’t clumsy, but she is extinct. She and her 66mm sisters were the rage for several years as the upscale heir to the Synta 80mm f/5 achromats, but then the big Chinese factories turned their efforts to bigger ED and APO refractors. The 66mm SD gave way to a 72mm, and even those scopes are no longer as widely available as they used to be. What were these little refractors like? No matter who put their brand name on ‘em or what color their tubes were painted, they were nearly identical under the hood. Much more solidly built that a Synta 80, that’s for sure. Integral, sliding dew-caps, upscale rotatable Crayford focusers, fully baffled tubes (the Patriot has 10 baffles), reasonably fast focal ratios of f/5.9. That’s not the most important part of the story of these telescopes, though; that’s what’s up front, the SD objective. What the heck is “SD”? It stands for “special (low) dispersion glass.” Really, it is the same as ED, “extra (low) dispersion” glass. The two-element objectives of the little scopes include one element of special glass (FPL 51, usually) that reduces chromatic aberration. With the modest apertures of the 66mm scopes and at their reasonable f/6 focal ratios, color is not a problem and is only noticeable (and is just noticeable) on the brightest objects. Before the 66es disappeared, William Optics was also selling versions with 3-element objectives, and even a Petzval set up, but the two-element model was always the most popular. While a number of outfits slapped their name tags on these nice little scopes, the big players were William Optics (then with a U.S. branch) and Astro-Tech (the house brand of astro-dealer Astronomics of Norman, Oklahoma). Both companies sold the scopes in a variety of color schemes; you could get blue ones, white ones, black ones, and gold ones. But there was only one Patriot. 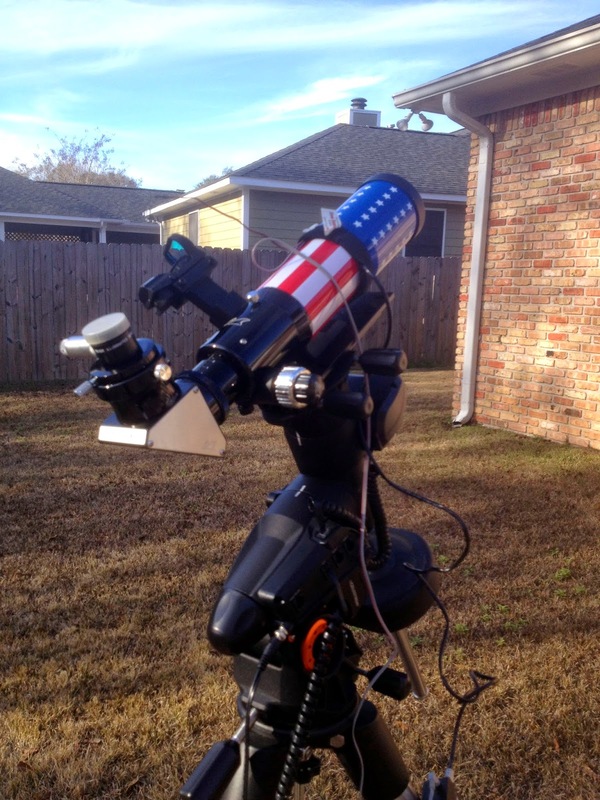 You have to be of a special mindset to appreciate some telescopes, and especially the Patriot. 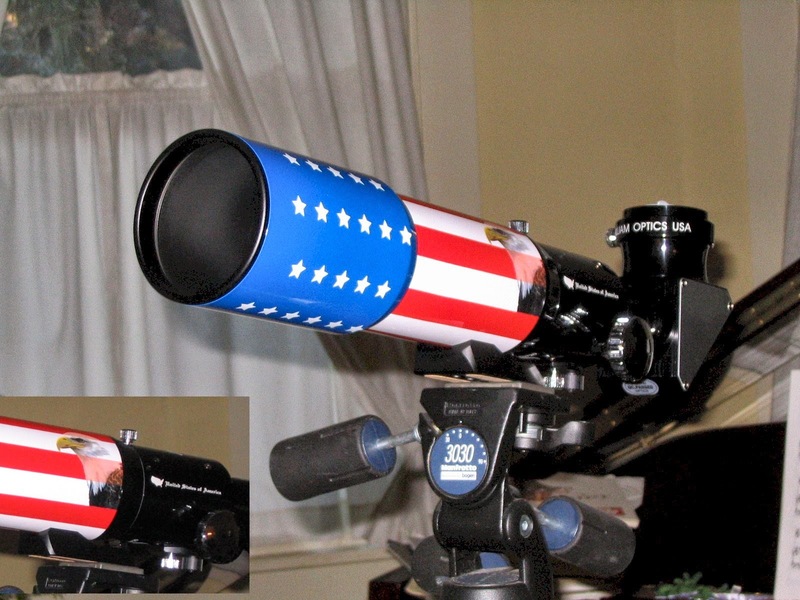 Not only is Unk basically a patriotic sort, and a vet, he admires scope paintjobs some might call tacky, like my ETX125, Charity Hope Valentine, whose tube is emblazoned with a silkscreened image (in color, yet) of the North America Nebula. The Patriot kicks things up several notches from there, y’all. She is decked out in red, white, and blue. Stars and stripes, that is. Not enough? There’s a full-color American eagle on the tube near the focuser. When William Optics offered to let me swap out my dour, blue-tubed 66 on a Patriot back in 2007, they sent me a brochure with full color pictures of what would become the most famous—or maybe infamous—66mm ED refractor of all time, so I thought I was prepared. When she arrived, however, I quickly decided the pictures had not quite done the scope justice. The little thing was a fracking Technicolor explosion. But, as I said in a long ago post, “Gaudy? I think she’s beautiful!” And I still did eight years hence, even if I wasn’t using the Patriot anymore. What got my li’l 66 out of mothballs? Mainly my desire to image M31, the Andromeda Nebula (“Galaxy” for you younguns). That huge island universe is too large to fit in the field of even my 80mm f/7 refractor. During the long ago CAV run recounted at the link up top, I’d taken some well-framed shots of the object with the Patriot and my old Meade DSI, so I figgered the little scope would be perfect for Andromeda-imaging with a Canon DSLR. One thing I knew for sure; the Patriot was capable of taking good pictures. When I was first learning CCDing, I got a couple of nice shots of the dim Rosette Nebula with the Patriot. “Dim” was no problem for the Patriot, of course. As you probably know, an f/6 66mm scope is just as capable of imaging a dim (extended) object as an f/6 200mm aperture scope. All that differs is the image scale; bigger for the bigger telescope. While I liked my shot of the Rosette’s donut, it had one failing, bloated stars, and thereby hangs a tale. 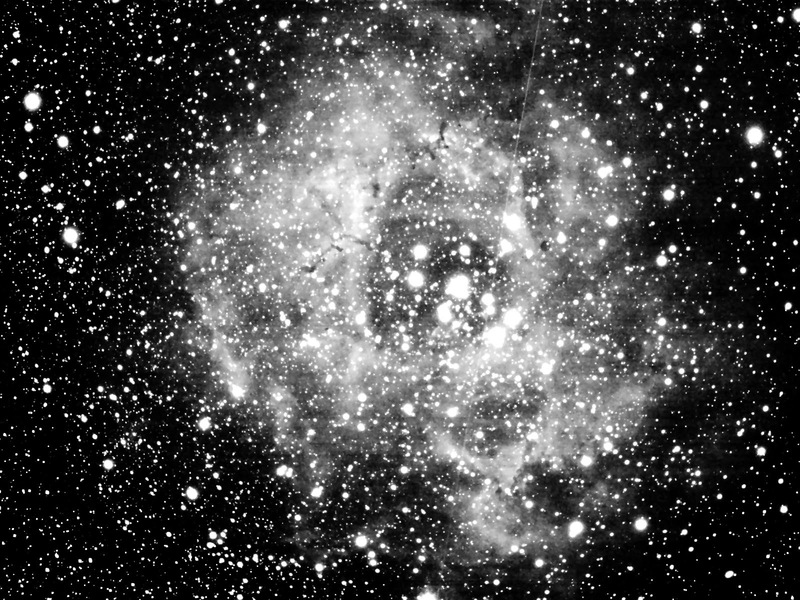 I was using an SBIG ST2000 CCD camera for the Rosette imaging run, a camera designed for astronomical use. Unlike DSLRs, it, naturally, lacks an IR filter to attenuate the red/infrared wavelengths. That is good in that it makes red nebulosity POP. It’s bad in that stars bloat badly when you use the camera with a refractor. The cure is to place a 1.25-inch IR block filter on the camera’s nose-piece. The trouble was that I’d left that 1.25-inch nose-piece at home. I’d have to attach the camera directly to the scope with a prime focus adapter. The problem there was that there is no way to thread a filter onto my SCT prime focus adapter. “Well, Unk, why in the name of everything that is holy would you want to use an SCT adapter with a refractor?” Because I had to, Skeezix. Aside from her paintjob, the most unusual thing about the Patriot (and her sisters) was the presence of an SCT style rear port on the Crayford focuser. It is threaded for standard SCT accessories, and that’s mostly what you have to use. Wanna 2-inch diagonal for your little guy? You have to use an SCT style diagonal. There was good and bad inherent in that arrangement. The good was that the threaded tailpiece allows very secure attachment of cameras. The bad is that not all SCT accessories work. You have to have one with a threaded ring. A threaded tube, a standard 2-inch SCT visual back, will not, for example, work. It threads on and keeps threading till it runs out of threads and is never secure. That means no non-SCT 2-inch accessories can be used in the scope. The above is not a problem for visual use, and it was not a problem when shooting pictures with the Meade DSI and my ST2000. I couldn’t figure out how to use a field flattener or a reducer, but the field was purty wide without a reducer, and the chips of those two cameras were too small to be affected by edge of field problems. In these latter days, however, I’d be imaging with the Canon DSLRs and their far larger chips. I’d just have to see how bad the field curvature was and try to rig up some kind of solution if it was not acceptable. The de-mothballing of the Patriot took place months ago, friends, and I still have not taken a shot of M31 with it. The reason? Clouds punctuated by Moonlight. I’ve still got time to get an M31 shot this year, but not much time unless we get a spate of good weather. Thus far, the conditions have not encouraged me to haul a scope and mount out anywhere other than to the backyard. Not even to the Possum Swamp Astronomical Society Dark Site. I’ve done considerable imaging from the backyard, but the sky’s too bright to make it easy to get a worthwhile picture of Andromeda. 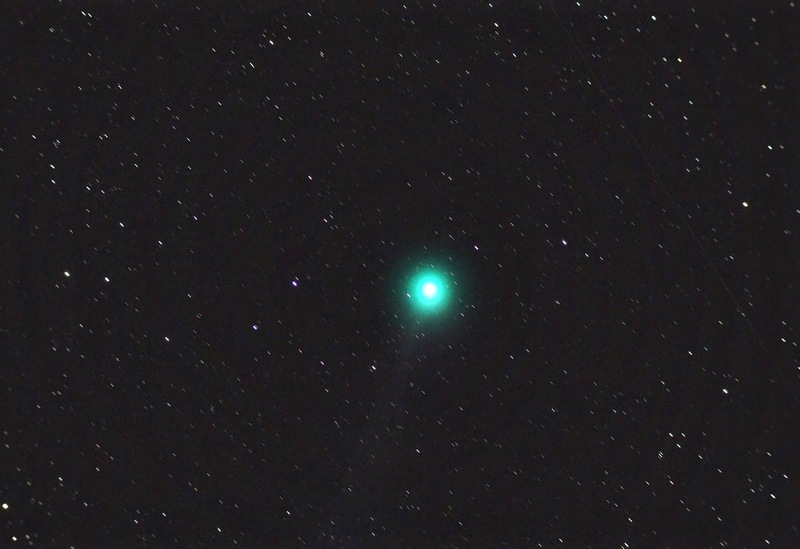 When the Moon finally got out of the way in late January, a visitor beckoned, Comet Lovejoy, C/2014 Q2. The comet was no Hale-Bopp or Hyakutake. It broke magnitude 4, but just barely, topping out at 3.8. That meant it was too dim to catch the attention of Joe and Jane Sixpack (or be easily visible with the naked eye from the suburbs). Nevertheless, it was "spectacular" as us amateurs reckon such things. I found it just barely short of exciting in my Burgess 15x70 binoculars, even with the presence of the nearby gibbous Moon just before the comet’s peak. Naturally, every amateur astronomer with a camera began to post comet pictures on the fraking Facebook. 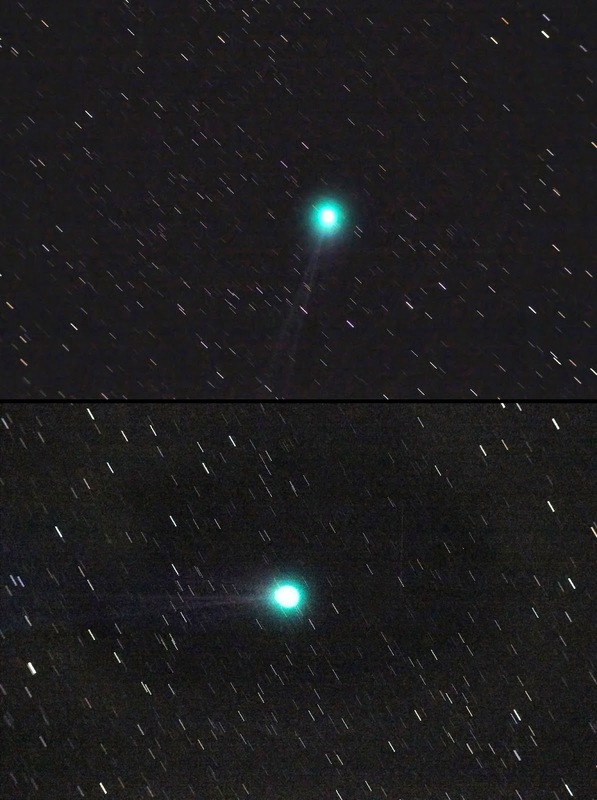 Lovejoy was a very photogenic stoplight green with a long, thin, narrow, spiky tail. Naturally Unk wanted to get in on the fun, but there came more clouds. Then rain. Lots of it. Eventually, there was a bit of improvement, but it wasn’t enough to impel me to pack up and head to the PSAS site. If I got the comet, it would be from the backyard of the New Chaos Manor South. While the weather forecast for Friday the 16th was not overly encouraging, it was good enough to impel me to set the VX mount up in the backyard and round up the Patriot. I actually didn't have much rounding up to do, since I’d checked the scope out at the same time I’d put the Megrez 2 back into service, and knew exactly where she was. What I did have to do was bolt a Vixen compatible dovetail onto her foot. Like many William Optics refractors, the Patriot has a bolted-on mounting “foot” in lieu of rings and a dovetail. You can mount the scope in a Vixen saddle via this foot, but it isn’t very secure. It was no trouble, however, to attach a hefty WO Vixen plate onto this foot with a ¼-20 bolt. Before I could image Lovejoy I would, of course, need to know where the dadgum thing was. One of my favorite planetarium programs, Starry Night Pro Plus 6.0, got me the coordinates in quick order. Almost any planetarium or planner program would have done the same, but few make getting comet positions as easy as SNPP. It automatically downloads updated orbital elements for comets and asteroids at startup, so all I had to do was search on and find Lovejoy. A right click and the selection of “Generate Ephemerides” from a menu, and I had a list of the object’s right ascensions and declinations for the evening. With darkness arriving, it was time to do the VX’s goto and polar alignments. I was not planning on guiding—didn’t figger I’d need to at less than 400mm of focal length—so I wanted to be careful with polar alignment. I did all 4 calibration stars in hopes of getting as close to the pole as possible during the All Star Polar Alignment procedure (which depends on the quality of your goto alignment), slewed to Diphda, ran the polar alignment routine on that star, redid the 2+4 alignment just be on the safe side goto-wise, and declared myself ready to go. Well, I’d be ready once the Canon 60D was on the scope. Taking care of that was simple: screwed an EOS T-ring onto a standard SCT camera adapter, attached that to the Canon in lieu of a lens, and screwed the whole shebang onto the Patriot’s SCT rear port via the prime focus adapter’s threaded ring. Different for a refractor, but the SCT adapter does provide a very secure mounting for a camera. Next was focusing. I like to do rough focus on a bright star, so I slewed the scope over to Aldebaran, which was not too far from the comet on this night. I hooked the Canon to the Toshiba laptop using the nice, long tether cable Miss Dorothy got me for Christmas, and ran Nebulosity 3. When Neb was going, I turned on the 60D, selected the camera in the program’s menu, and dialed in an exposure of .5 second. I then mashed “frame and focus,” and tweaked focus until the orange star was as small as I could get it. When it was, dimmer field stars began to pop out, and I continued adjusting the Patriot’s Crayford till they were as small as possible. That is still not good enough. When I was done with rough focusing, I pushed the “Fine Focus” button. Neb then instructs you to click on a (non-saturated) field star. When you do so, the zoomed-in star is placed in a small window and you are presented with two sets of numbers, “Max,” and “HFR,” (half-flux radius). I mainly just watch HFR, and focus till it is as small as it gets (Max will then be as large as it will get). That’s all it takes. I rarely use a Bahtinov mask and don’t pine for an autofocus system. Rubber meets road time. I navigated the NexStar Plus’ hand control menus till I got to “Goto R.A. Dec,” and entered the first coordinate pair on the list I’d printed from Starry Night. The motors hummed and stopped, I upped the exposure to 1-second, hit frame and focus again to make the cam take multiple exposures, and saw…nuttin’ honey. Which was surprising. One thing you can say about the VX is that her gotos are always dead-on after a decent alignment. All over the sky. Still, the comet was in a spot that’s difficult for most goto systems, approaching zenith. I had another suspicion as to what the problem was, howsomeever. A look at my list of R.A.s and decs showed the values I’d used were for an hour from now. Was the comet moving fast enough that it would be in a significantly different position in an hour? Mebbe so. I ran back inside to my office, generated a fresh ephemeris for the current time, scrawled the figures on a scrap of paper, scurried back outside, and punched them into the HC. Ahhh! There he was, almost dead center in the frame. Bright little feller. And not really so little, either. In a half second exposure the head/coma was surprisingly large. Time to get the picnic underway. What I most like about Nebulosity is that once I get it running I don’t have to worry about it. It is very reliable and has never messed up an imaging sequence or crashed. I told it to give me 30 exposures with a duration of 30-seconds each. I intended to start with short ones in case the comet was moving real fast, and up them to a minute or two minutes in the next series. I wandered back inside to the den for a little TV and let Neb do its thing. Unk ain’t no dummy. Not a complete one, anyhow. Even given the reliability of Nebulosity and the VX mount, I was wary. Every astrophotographer has a couple of friends, Mr. Murphy and Mr. Finagle. If something bad can happen, you can darned well bet it will. So, after about 10-minutes I stepped out onto the deck during a commercial break in—what else?—Finding Bigfoot to see what was up. At first it ‘peared all was well. Another frame clicked off just as I approached the Satellite laptop. But what the hail was with the background? It was a nasty-looking reddish-brown. “Hmmm…that usually means…GULLDERNIT!” Yep, a look up showed the formerly clear, if hazy, sky being rapidly covered in clouds. I’d got only nine thirty second exposures, not nearly enough to show the tail well, I feared. So, you can bet I was amazed and happy the next morning to see I actually did capture the tail, if barely. Standing there looking up at the clouds that night, however, Unk was right put out. Nuthin’ for it but to pull the accursed Big Switch and go in search of the Rebel Yell bottle. There was something different when it came to pulling that switch on this evening. Looking at the ten-day weather forecast on TWC, it appeared we might get a string of maybe four-five nights of acceptable, if not great, conditions. That being the case, I chose to cover the scope with my Desert Storm cover instead of tearing the rig down, and I chose to hibernate the scope rather than just turn her off. The NexStar HCs, both the Plus and the older models have a hibernate feature that allows you to shut down the scope and preserve its alignment. The current alignment values are stored in non-volatile memory, and as long as you don't physically move the mount, no alignment is required when you wake it up the next evening. I followed the instructions, placing the scope in my desired position (I moved her with the HC until she was on the R.A. and dec marks), hit Enter, and turned off the power when the hand control told me to. I’d never used this feature with the VX before and was interested to see how well it would work. It worked very well, even if that was about the only thing that did Saturday evening. When darkness fell, I went out and turned the mount on. The HC displayed the time from the mount’s Real Time Clock and enquired as to whether that was OK. Little fast, but close enough for government work, so I hit enter. The HC then responded with “VX Ready.” We’d see about that. I decided a focus check was in order and issued a goto command for Aldebaran. When the VX stopped, the star was dang near dead-center on Nebulosity’s display. Otherwise? Well, the night wasn’t bad; it just wasn’t good. Tracking in two-minute subs was fine. The computer and Nebulosity behaved well. But the sky was just not there. There were no clouds, just really, really poor transparency. I could tell by the look of the raw frames onscreen that is wasn’t going to be much of a night. Nevertheless, Unk forged on. It was marginally clear, and who knew when that would happen again? When I had had enough frustration I hibernated the VX again. Almost unbelievably, campers, the sky held on for yet another night. In fact, Sunday was noticeably better than Saturday as far as transparency. However, I suspected that the comet, which was really taking a powder now, might be a little dimmer on this evening. Hokay. What say we speed things up with a focal ratio even faster than f/6? How to do that? 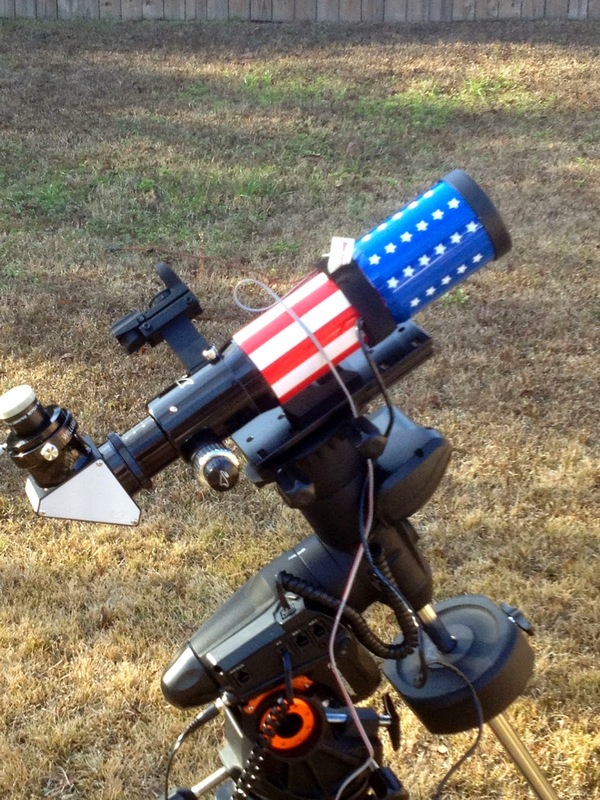 Well, the Patriot had an SCT back; what if I screwed a standard SCT focal reducer onto it? That would get me really fast optics and might the corrector aspect of the reducer/corrector flatten the refractor’s field? I decided to find out. When Sol was out of the way, I screwed the reducer/corrector onto my pretty little Patriot, attached the Canon and prime focus adapter to that, and woke up the mount. As before, goto was perfect following hibernation. When the motors stopped, a big blob I knew was Alpha Tauri was once again close to the center of the screen. I started rough focusing, and began moving the scope’s drawtube in. I knew it would be a close thing, and had removed the prime focus adapter’s extension tube. Close, but no cigar, y’all. I needed at least an inch more in-travel. Oh, well, good idea even if it didn’t work, I reckoned. I continued with the fleeing Lovejoy anyhow, doing 2-minute subs all evening. When the fuzzball crossed the Meridian, I began to keep a close watch on the camera’s position with regard to the tripod’s legs. When it got a mite close to one, I stopped the exposure sequence, and issued a new goto command with the current R.A. and declination values of the comet. When I did that, mount did what us GEM lovers call a “meridian flip;” it moved to position the scope on the east side of the mount to track the comet as it descended into the west. The photos I got on this night were my best I’d, but it was still disappointing that I couldn’t quite make the tail pop out like folks shooting from darker locations could. Well, what if I tried a light pollution filter? I’m not big on filters for astrophotography, since they change color balance and dim the images. Still, a mild filter like the 30 buck Zhumell imaging filter I’d picked up last fall might help a little. It had undeniably improved my shots of nebulae from the PSAS dark site. The problem was how to attach the thing to the camera. As above, the SCT prime focus adapter makes no provision for filter use. There was no place to screw one on. Well, darn. However, I also had a 1.25-inch filter, a similarly mild one from Orion, I’ve owned for a couple of years and used with my Mallincams occasionally. What if I attached that to the nose-piece of an inch-and-a-quarter non-SCT prime focus adapter and inserted that into a 2-inch/1.25-inch adapter in the Patriot’s rear port? I rounded up my Orion prime focus adapter. Its 1.25-inch nosepiece would accommodate a filter, but its body was clearly too long to allow me to reach focus. Dangit. Hmmm… Digging deep, way down deep, into the old Junque Box, I fished out a Meade prime focus adapter I’d had since the 1980s. It has a 1.25-inch filter-threaded nosepiece and a body at least an inch shorter than the Orion’s. Comparing the SCT adapter and the Meade side by side, it looked like the Meade might be just short enough to work. Monday was MLK Day, so I didn’t have to teach my classes at the University and was able to hit the backyard for, amazingly, a fourth straight night of astrophotography. Following another successful awakening of the mount (I am loving that hibernation feature, if you can’t tell), I started focusing. Moved the focuser in an inch. Aldebaran was still a blob, but a smaller blob. Still plenty of in-travel. ‘Nother half inch. Smaller still, but still way out. I was beginning to sweat now, with about half an inch of travel remaining. Little bit more and, bingo. With about ¼-inch left, we were close to focus, and I was able to tweak it in with Fine Focus. In the end, I had about 1/8-inch to spare. How’d the filter do? It improved Lovejoy’s tail a little. Given that the comet was now slightly dimmer than it had been when I began the run on Friday, I believe it helped significantly. When I’d fired off the last shot of Lovejoy I wasn’t quite ready to hunt up the whiskey, however. 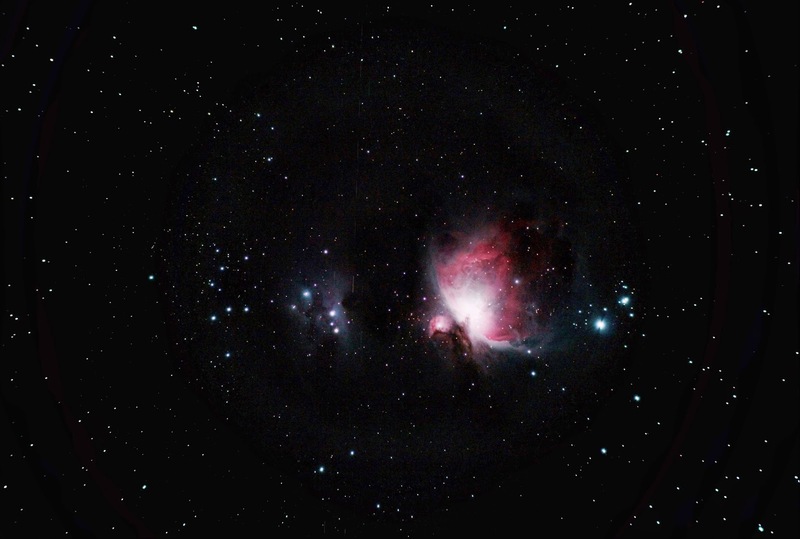 M42 was above the trees in the darkest part of the sky, and I couldn’t resist shooting old faithful. I knew the results wouldn’t be great. You don’t get “great” with a sky as bright as mine, but what came from my messing around with Photoshop and Lightroom was good enough to please old Unk, as you can see here. The “messing around” consisted of significant processing to get rid of (most of) the nasty light-pollution gradients and some artifacts caused by the filter (I think). So that was the end for the comet, more or less. I did get out with my C102 and do a little visual looking (finally) as the evil gray and white fluffy things rolled back in Tuesday and that was purty much the denouement. That was hardly the end for the Patriot, however. It will be my scope of choice for wide-field vistas from this time forward, I think. The little thing is just so EASY, muchachos. Easy to set up, easy to use. She’s solidly built and light, and even if I didn’t like her fancy raiment, I’d like that, muchachos. What brought this one to mind? The current comet, Wirtanen. It's not as good as Lovejoy was, not visually anyway, and not photographically given the images I've seen--I haven't yet got out and shot any of my own. The reason for that? As in early 2015, the weather. Above all, I remember January 2015 as "The Time of the Comet." It coincided and seemed to herald changes I was beginning to undergo. After quite a bit of denial, I had awakened to the reality that life after retirement would bring differences in my outlook. Including my outlook on amateur astronomy. In addition to mental changes, 2015 brought physical changes. It wasn't long before I had to admit the C11 and CGEM mentioned in this article were just not practical anymore. Don't feel sorry for me, though; I've found ways to observe and telescopes and mounts to observe with that are different but as much fun. I just don't dare lift 50 or 60 pounds onto a tall tripod or pier anymore. How about that pretty little Patriot? I still have her and still use her on occasion. She is a very good telescope. If there's a down-check for her, it's that my unarguably more capable 80mm fluorite Willam Optics refractor is no more trouble to set up. The 66 does have her uses, however. She is for the times when I want maximum field, but with a quality even a good SLR lens can't deliver. I did not do one viewing session last year for various reasons (the one star party I went to got rained out), but last night (first time in about 16 months) I felt the urge. My rubberized C90 on my Manfrotto CF lets & 501 video head got the call for Jupiter. I was using a 20mm Celestron silvertop EP. A little fog set in which reduced the brightness, which was just fine. The little 90 was not cooled but still put up an image that was extremely clear with clearly defined belts. I've had this little guy since 1996 and have written you over the years about how good my C90 was. The very best thing, is that every time I've lost the urge, it's always something like M31 or M13 or Jupiter or Saturn that sparks the interest and the C90 always gets the call. But it was my first scope and while it spends a lot of time in its case, I will never part with it. Last night got me so jazzed (and my Video mount/head was so steady), I thought what the heck a pair of large Binoc's always ready with an plat for the video setup might get me out more. So my 80mm 20X starmasters (heck if I can collimate my C8, how hard can a pair of Binoc's be) are on the way. I will compare them to my Eagle Optic's 10 x 50's but I don't expect a $100 pair to match the $400 Optic Premiums. You blog is one way (and I still belong to the Rose City Club just to support it) I keep in the game. Thanks and keep writing = perhaps another adventure with the C90? Would you please care to elaborate a little on your 'messing around' with PS and LR?... I often have these background gradients across the image as well. I use LR and have PS CS 3, if the latter is any good for that. Thanks!